I love running flower workshops! I taught creative workshops for over a decade before setting up Amaranto Flower Design. I get so much pleasure from sharing knowledge and skills with creative and like-minded people. All classes include refreshments to help keep your creativity flowing! Working in small groups in a relaxed atmosphere, you will create your own beautiful floral arrangements that you can take home and enjoy. Wherever possible, we will use English blooms from local flower growers. All materials and tools are covered within the cost of the workshop. You only need to bring an apron to protect your clothing and some gloves to protect your hands, if desired. Come and join me in this fun workshop and learn how to make a lovely hand-tied front-facing flower bouquet. During the session, I will demonstrate the technique for building a lovely, loose bridal bouquet. I will also show you how to finish them off with some beautiful trailing ribbon. We will use beautiful, fresh and seasonal flowers, and I will leave you with some helpful tips on how to condition and maintain your arrangement. Spend a few lovely hours learning how to make and decorate your own eco-friendly wreath! This is a relaxed and fun class where we will be creating a beautiful, eco-friendly, floral Christmas wreath. We will use a variety of foliage and fresh flowers on a copper wire frame. The evening class will start with a demonstration, and you will then be guided through designing your own floral wreath. Perfect for hanging on a door, to give as a gift, or to use as a table decoration. These wreaths are eco-friendly and can be deconstructed to be composted. We will not use oasis bases, as these are not biodegradable and harmful to the environment. This means your wreath will dry naturally, so we will learn about what materials stay freshest for longest. Come and spend a delightful evening learning how to make a completely natural living wreath using a metal frame, moss and succulents. Unlike a traditional wreath, it will keep on lasting! 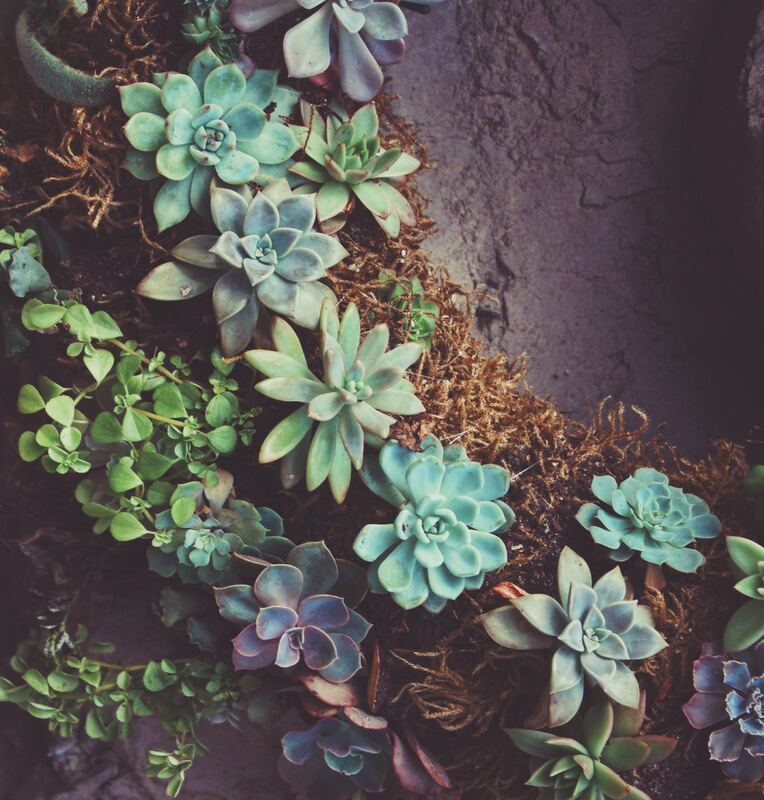 This three-hour workshop will teach you how to hand-wire moss and succulents together to create the most gorgeous botanical delights for your front door or to use as a table centrepiece. I will give you a demonstration and you will then be guided through designing your very own beautiful living wreath. We will not use oasis bases, as they are not biodegradable and are harmful to the environment. 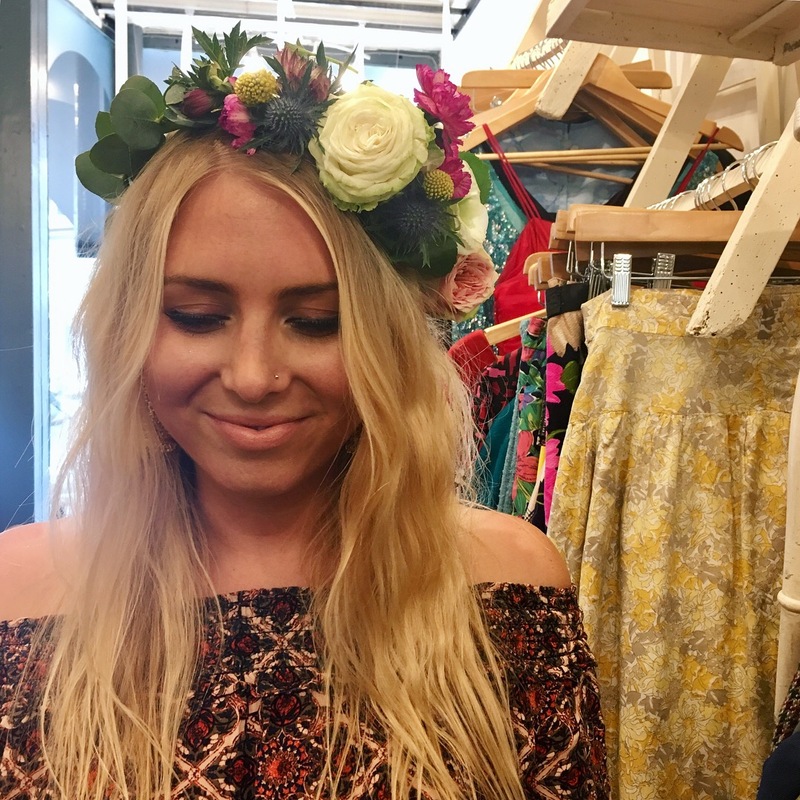 Join me and learn how to make a beautiful flower crown! 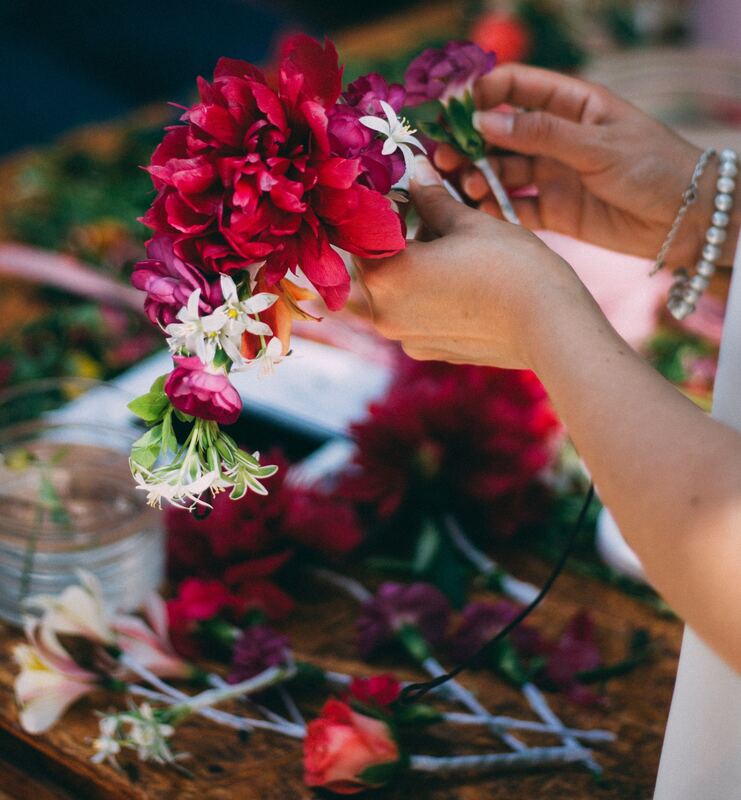 This evening workshop will teach you how to hand-wire fresh flowers and foliage to make your very own handmade flower crown. We will use beautiful, fresh and seasonal flowers and I will give you advice on how to condition and maintain them. We will start with a demonstration, then you will be guided through designing your own crown. £25.00 per person, includes all materials. This is a fun and relaxed workshop where you will learn the art of making Kokedamas. 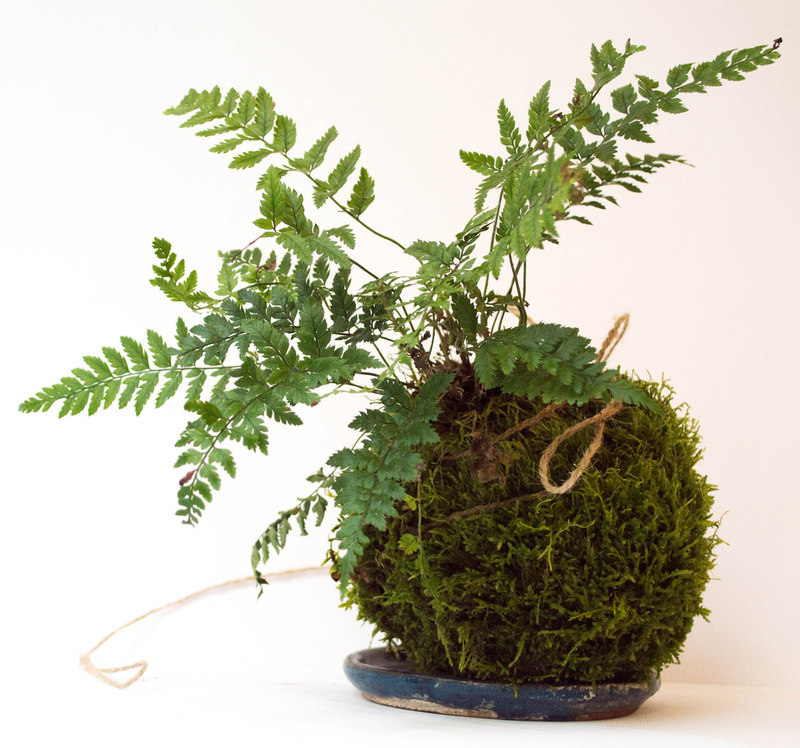 Kokedamas, or ‘moss balls’, are a Japanese style of planting, using soil and moss wrapped around the roots of a plant. I will give you a demonstration and you will then be guided through designing your own Kokedama. We will use beautiful, fresh plants such as ivy and ferns. 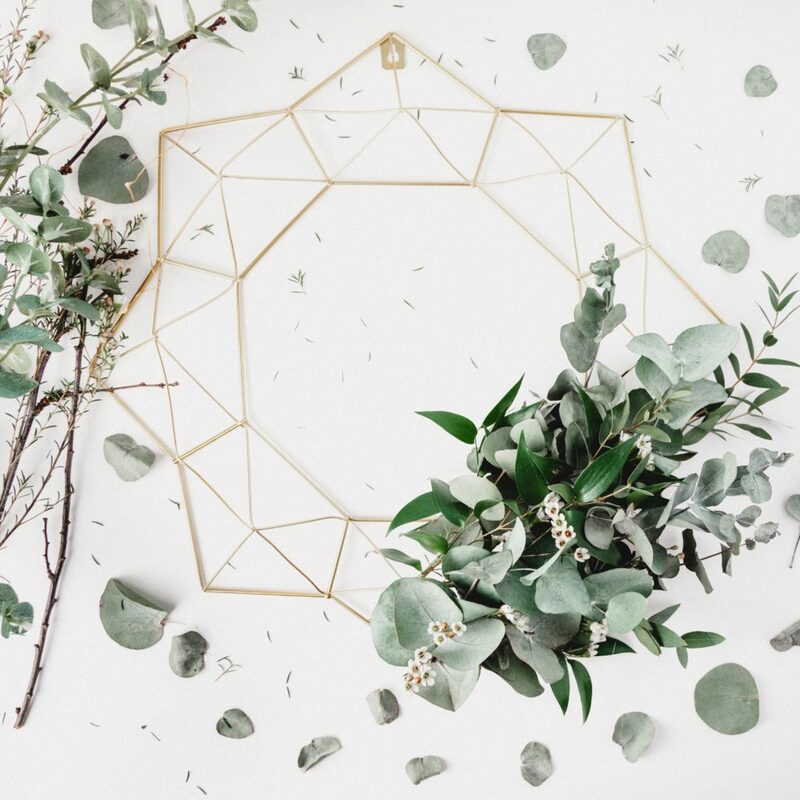 Each participant will choose whether to make a design to hang from a ceiling or shelf, or to sit on a surface, creating a beautiful and natural-looking way to grow your plants! 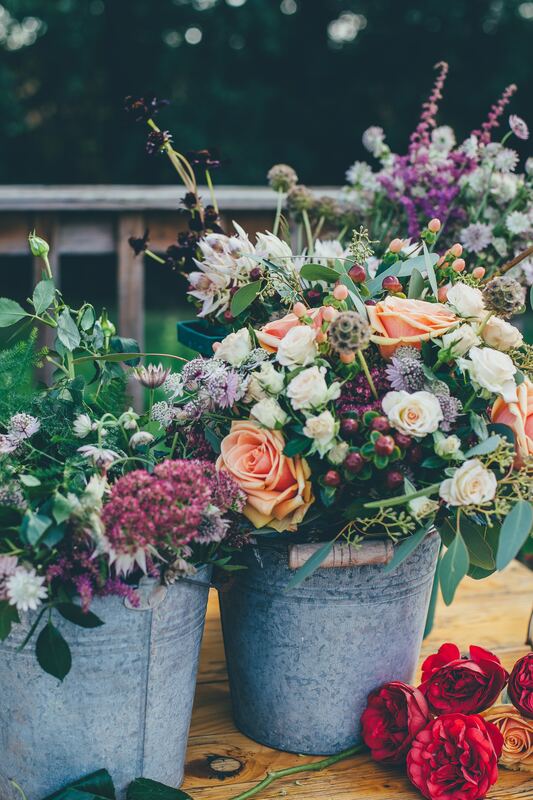 This course is for brides and grooms who would like to be more involved in arranging their own flowers for the big day, or who are on a smaller budget. During the session, I will demonstrate the various techniques for building all of the arrangements, and you will have the chance to ask as many questions as possible. If you already have an idea of the type of wedding you’re going for, I suggest bringing some pictures along for inspiration, so that I can tailor the advice given to each participant as much as possible. If you have any items you think you would like to include on your big day, please do bring them along so I can suggest the best way to use them. This workshop is limited to 6 places, so that you can get all the attention you need to succeed in learning the various techniques. All of the arrangements will be yours to take home at the end of the day. 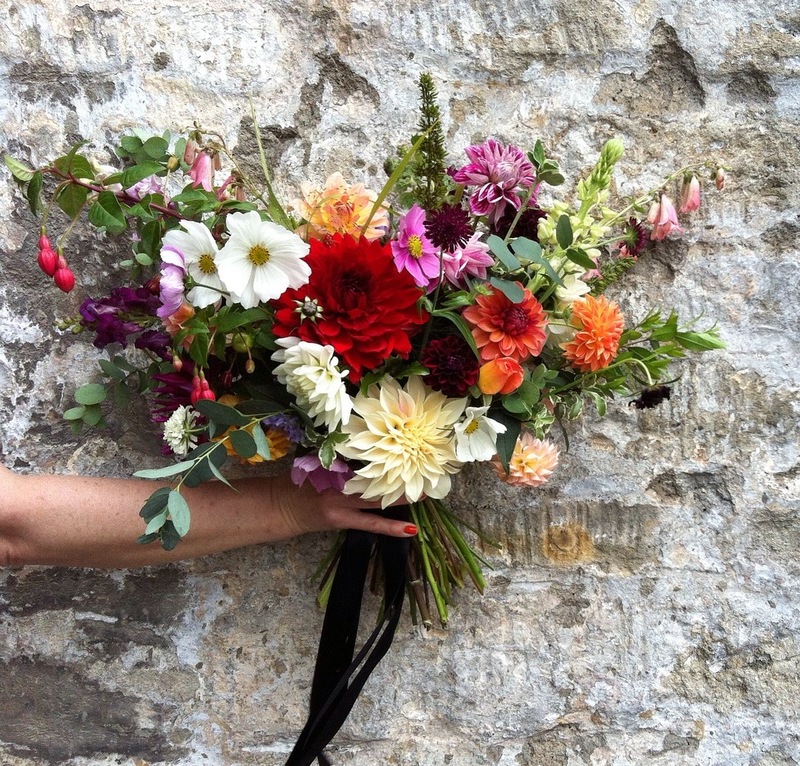 As part of the course, I will also provide you with a pack that will advise you on the best types of fresh flowers to use based on the time of the year you are getting married, and a list of English flower growers local to the Bristol and South West area. If you would like to have a bridal bouquet to be made by me, we can discuss that in more detail prior your big day (at least 6 months prior) and I will be happy to give you a 10% discount on the price. I am happy to provide private floristry workshops to groups of 6 or more. These floral workshops can be tailored to suit your needs – these can include bouquet making, flower crowns, garlands and wreaths. But if you have any other ideas, I am more than happy to discuss them with you and find a way to accommodate your request. Private bookings can be held at my florist workshop or I can come to your home or venue of your choice. Please contact me for more information. Sadly I cannot issue refunds on cancellations, as there are a limited number of spaces available on my workshops and I may not be able to re-sell your space. Sorry! I am however happy to swap your space onto a different workshop of the same value as the one initially purchased within three months of cancellation.